Another celebration that our company is becoming ever popular for is the Jewish recognition from childhood to adulthood. We have been blessed to work with the most amazing children experiencing this exciting rite of passage. We have learned so much, and thought it would be fun to share a little of the knowledge we have picked up along the way! Bar Mitzvah (Hebrew: בַּר מִצְוָה) is a Jewish coming of age ritual for boys. Bat Mitzvah (Hebrew: בַּת מִצְוָה; Ashkenazi pronunciation: Bas Mitzvah) is a Jewish coming of age ritual for girls. The celebration can take many forms, as many aspects of the celebration are flexible. Before reaching the bar mitzvah or bat mitzvah age, the child’s parents hold the responsibility for the child’s actions. After this age, the boys and girls bear their own responsibility for Jewish ritual law, tradition, and ethics, and are able to participate in all areas of Jewish community life. In addition to being considered accountable for their actions from a religious perspective, a thirteen-year-old boy may lead prayer and other religious services in the family and the community. Bar (בַּר) is a Jewish Babylonian Aramaic word literally meaning “son” (בֵּן), while bat (בַּת) means “daughter” in Hebrew, and mitzvah (מִצְוָה) means “commandment” or “law”. So bar mitzvah and bat mitzvah literally means “son of commandment” and “daughter of commandment”. However, in rabbinical usage, the word bar means “under the category of” or “subject to”. So Bar mitzvah can translates to “a (person) who is subject to the law”. Although the words bar mitzvah & bat mitzvah is commonly used to refer to the ritual itself, in fact the phrase originally refers to the person. The most common place and time for a bar mitzvah celebration is in the synagogue during the Shabbat morning services. The services include the reading of the Torah, during which the young celebrant may chant from the Torah. At the conclusion of the prayers, guests generally regroup in the social hall, where they enjoy a festive reception. Parties were first mentioned in association with a synagogue bar mitzvah in the 13th century, so throwing some sort of party is traditional and frequently seen as necessary. Presents can be offered to the celebrant, while the rabbi or teacher gives them their blessings, they may also commemorate the event in different ways such as taking the bar or bat mitzvah on a special trip or organizing some special event in the celebrant’s honour. In many communities, the celebrant is given a certificate. According to the Orthodox view, the bar mitzvah boy is so happy to be commanded to do mitzvoth and earn reward in the next world for his efforts, that he throws a party and has a festive meal. Some countries like America often have lavish affairs held at hotels and country clubs with hundreds of guests. When is a Bat & Bar Mitzvah held? If the bar mitzvah is on a morning other than Shabbat or a Jewish holiday, chances are that the bar mitzvah boy and his male Jewish guests over the age of 13 will be putting on tefillin, a tefillin are a pair of black leather boxes containing Hebrew parchment scrolls. A set includes two—one for the head and one for the arm. Each consists of three main components: the scrolls, the box and the strap. If you have been invited to a morning bar mitzvah and you have tefillin, bring them along. If not, the rabbi or another friendly local will probably be happy to help you into a pair. 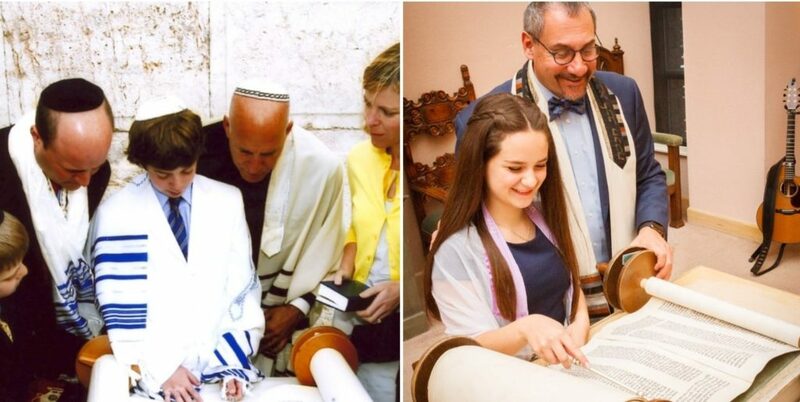 If the bar mitzvah celebration is on Monday, Thursday or Rosh Chodesh (the first day of the Jewish month), the Torah will be read as part of the service, like on Shabbat, and the celebrant will probably either read from the Torah scroll or be called to make blessings over the Torah. Bar mitzvah attire is usually formal. For ladies, pick a modest skirt and top or dress—something you’d wear to a business meeting. For guys, dig out a pair of conservative slacks and a button-down shirt (and a jacket and tie if you’re that kind of guy). Of course, you will want to have your head covered by a kipah (small cap). If you don’t have your own, there’s a good chance there will be some spares near the entrance to the synagogue (if that is where it will be held). If you’re married, you’ll also want to be wearing a tallit (prayer shawl that is draped over the shoulders), and tefillin if the celebration is not on Shabbat.